Unfortunately, not every campsite pad is going to be concrete and level for your RV or trailer setup. You will encounter sites filled with gravel, sand, full of potholes or other bumps and lumps. Now you don’t want to fall asleep while falling against the side and you don’t want to damage your RV refrigerator (which needs to remain level to function). You will need to level your RV or travel trailer yourself. What do you need to make everything level? Why RV or travel trailer jacks, of course! Let’s look at this convenient tool including the benefits of RV or travel trailer jacks, and what you should look for when buying them. With a little help, you don’t have to worry about the eggs rolling off your kitchen counter. There is one significant benefit to RV or travel trailers jacks, and that is keeping your RV level. Maintaining your RV level will have many benefits including keeping the cabin or your travel trailer comfortable, keep objects where they’re supposed to stay and, of course, keep your absorption refrigerator working right. Unless you know you will be staying in a level RV pad, it’s a good idea to keep a few jacks on board with you. There are many types of RV and travel trailer jacks and what you buy will depend on the type, size and weight of your RV. There are stabilizing jacks, scissor jacks, slide out stabilizers and more. More than likely you will use an RV travel trailer jack in conjunction with other leveling items like tire chocks, locking chocks and leveling blocks. Buying a jack, stabilizer or leveling blocks can be a little tricky depending on your trailer or RV. You need to make sure that the jack and your rig get along correctly. Choosing the wrong jack could cause damage to your RV, could break the jack or you could be snoozing and feel the jack give way, leaving you trying to restore order with a jack that won’t work. When shopping for a jack, you need to bring information about your particular RV along with you, especially your RV’s height, weight, and dimensions. You can work with an associate at your local RV dealer or parts store to find the perfect jacks to keep you nice and level. Pro Tip: When you buy an RV, one of the best ways to get the right trailer jacks for your model is to buy or order them on the spot. This way you're not only getting the correct ones for your RV, trailer, or camper, but chances are you'll save money bundling them with the original purchase instead of spending more down the line. As is the case with hitches, quality is critical when purchasing an RV or travel trailer jack. Flimsy or cheap jacks will likely function fine for a while but will fail long before you want them to. I know a lot of RVing is about saving money but in the case of a leveling jack, feel free to spend a bit extra to ensure you get a quality product. Look at customer testimonials and reviews, construction and different warranties to make sure the product you’re purchasing will function for you and for a long time. It is vital that you know exactly what you’re doing when operating a jack, stabilizer or leveling block. Failure to do so could cause damage to your RV, a broken jack, and could even lead to physical injury. Take time with both your jack and RV manual so you know exactly where you’ll be placing it and that the two can work together. Have an expert at your local RV store or dealership prove their use if you want to feel confident. That’s a great start on learning about RV travel trailer jacks. Make sure your RV and jack match up, choose quality over saving money and make sure you know how to use it before damaging your ride or yourself. 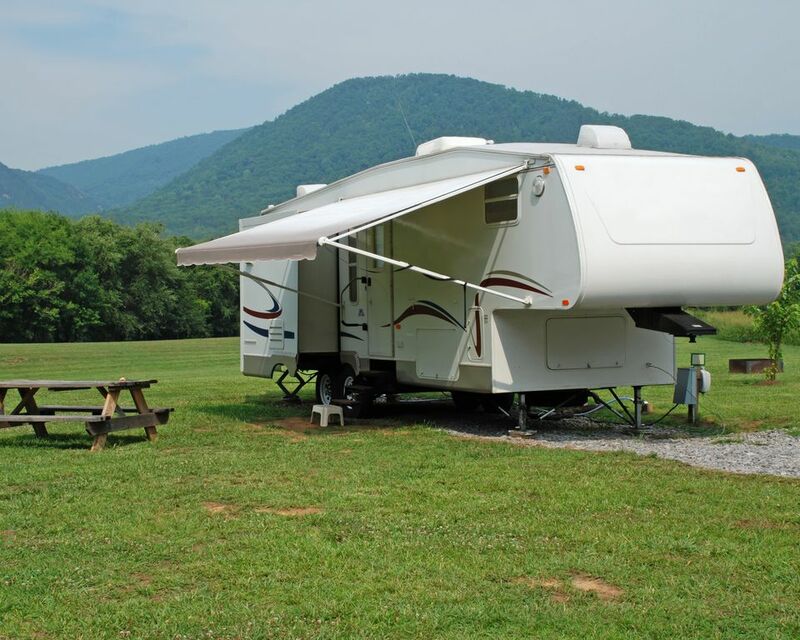 Pull in, level out and enjoy yourself at the RV park, campground or resort of your dreams.